If you’re considering storing your valuables or sentimental goods in a self-store facility, there are many things to consider. Price, location, accessibility, and most importantly, security. 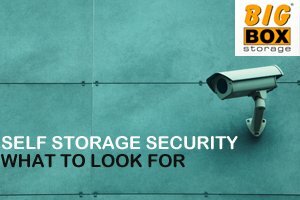 Security should be at the top of your list of priorities to research when choosing a storage facility. You should not even consider choosing a facility that doesn’t have at least four major security measures in place. In fact, the more security the better. Otherwise, you will be putting your personal belongings at serious risk. After all, if your belongings didn’t have value and meaning to you, you wouldn’t be storing them in first place. Visiting potential facilities in person is an important part of the decision-making process. Your own personal visual inspection of a facility will help you determine if the facility meets your standards. Preventing theft at storage facilities has becoming a major issue as more and more incidents of theft and damage are reported each year. • Well lit – in the winter when the sun goes down early, a well-lit facility will provide extra safety for you and your belongings. While motion sensing lighting is effective, ‘always-on’ lighting will provide you with a feeling of security when you’re on-site. • On-site after hours security guards – video surveillance will capture unwelcome visitors on film, but it can’t chase them away! Additionally, the facility should be well staffed. A facility that only has one or two employees is probably not your best choice, after all, most storage facilities are fairly large, so how could one or two people adequately manage and oversee the facility effectively? While the security of a storage facility is an important factor in which one you’ll choose, there are also extra measures that you should take regardless of where you store your belongings. • High quality locks – never buy cheap quality locks that can be easily removed. Round discus locks are best for your storage unit. The lock should have a short shackle (the loop that passes through the door) to prevent the use of bolt cutters. • Keys - never have extra keys laying around. Keep one on your key ring and another in a safe, secret location just in case you need it. Otherwise, you and your family members should be the only people with access the key. • Access Code – Choose a unique access code. Treat this code with the same level of security you would treat the PIN code you use with your debit card. Don’t share it with anyone! • Location of your items – pack the most valuable items at the back of the unit. This will help protect your belongings from a ‘smash and grab’ where only the most visible or easily accessible items are taken. • Try to stick to daylight hours when accessing your unit. This will allow you to easily identify your surroundings and anyone lurking in the area who may look out of place. Insurance is another important factor in deciding how to store your personal belongings. When you’re researching facilities, be sure to inquire about what type of insurance coverage they offer. As well, bone up on your home owners policy to see what coverage you’re entitled to under your existing policies. Not all facilities will offer insurance, however any reputable facility will require proof that you have applied coverage from another source. If a storage facility does not offer insurance, having your items covered under your home owner’s policy is a must. Additionally, you can purchase more coverage from your existing insurer, or use a third party insurer who specializes in this type of coverage. 1. What type of relationship has the facility established with the local police? 2. How often (if at all) do the police monitor and visit the area? Remember, there are many different self-storage companies out there, and not all of them are created equal. Some of them care more than others about your personal belongings. So do your research, make sure that all of your security expectations are met before making your final decision. We truly treat and care about your belongings as if they were our own. So if you’re looking for secure, self storage in San Diego, you can count on Big Box Storage.